Defrost spinach and squeeze out all the water from it you can (* if you are making this vegetarian and not using chicken broth, save the “spinach juice” to moisten the mazto meal). 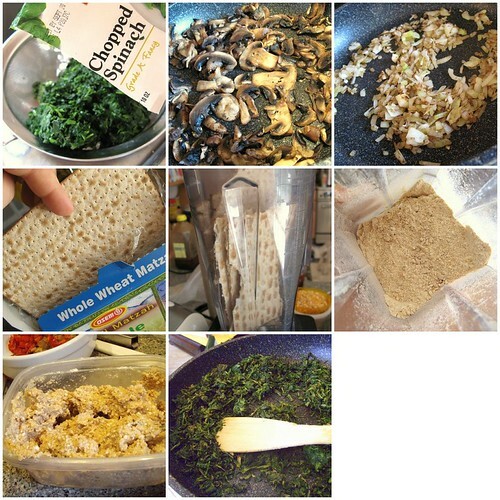 Grind the whole grain matzos in the bowl of a food processor to make matzo meal (if unable to find whole wheat matzo meal). Put in a large mixing bowl and stir in 1 cup chicken broth (or spinach water) to moisten. Saute the spinach in a large non stick skillet to cook out additional moisture, adding minced garlic after a few minutes. 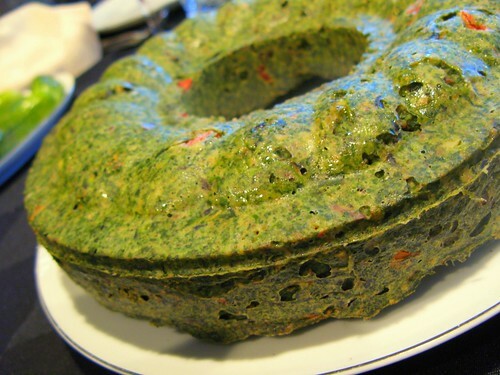 Remove spinach to the bowl of the food processor and allow to cool while preparing the rest of the ingredients. Saute the diced onion and mushrooms until nicely browned, put in mixing bowl. Slice the carrot into coins and add to pan with a sprinkling of water. Cover and allow to steam for 2-3 minutes. Add to mixing bowl. Dice peeled and seeded roasted red pepper in a large dice (about 1/2 inch square) and add to mixing bowl. Add zatar or other seasonings and stir to combine all. 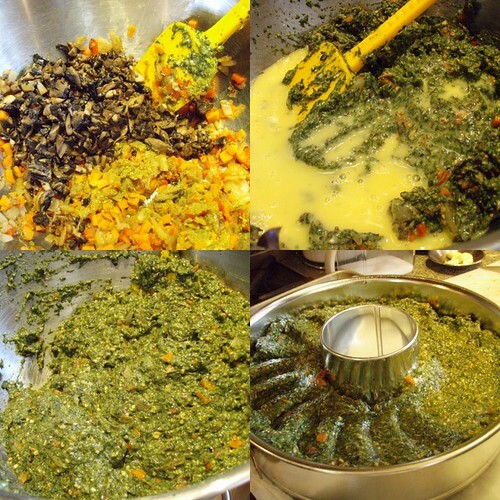 Pulse the spinach in the food processor to cut it smaller and add to mixing bowl. Add the Egg Beaters (or 12 whole eggs if not watching your fat and cholesterol) and thoroughly combine. Taste for seasonings, you might want to add some more salt & pepper. Place a few layers of paper toweling on sheet pan just large enough to hold your tube pan baking dish. Grease the spring closure tube pan (fluted tube pan optional, a bundt pan would work too) with cooking spray and place on top of the paper toweling. Spoon batter into tub pan and smooth the surface. Place pan on tray into the oven and pour water onto paper toweling just under the level where the spring pan seal is or to the level of the sheet pan lip if not using a pan with a spring closure, like a bundt pan. Bake for 45 minutes to 1 hour, depending on if you are serving immediately or if it will be reheated later. These are some “Lower Carb” Matzos we picked up this year which use whole grains. 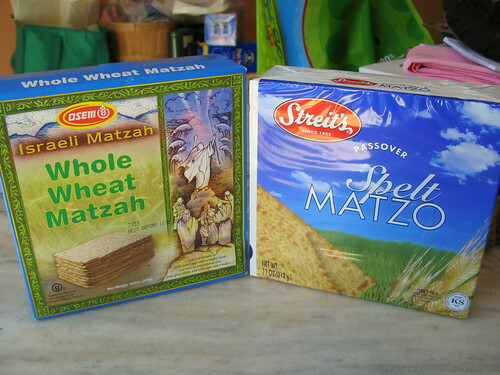 On the left is an imported Israeli Whole Wheat, on the right is a Streit’s (US Brand) Spelt Matzo. Zaatar is the spice mix which really makes this dish. We wanted a Mediterranean, Middle-Eastern flavor to this vegetable kugel to compliment our Ashkenaze-focused meal. 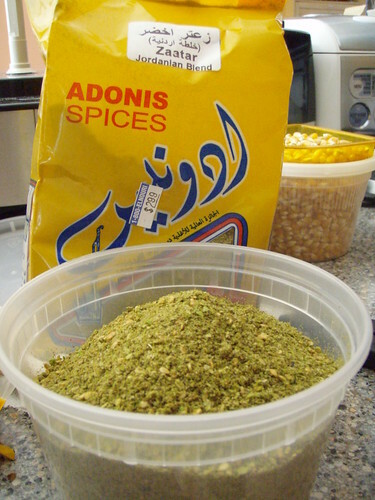 This particular Zaatar spice mix is a Jordanian blend, but there are many other types of Zaatar blends you can buy in Middle Eastern markets of different ethnicities. This entry was posted on Sunday, April 20th, 2008 at 12:11 pm and is filed under Food, Recipe. You can follow any responses to this entry through the RSS 2.0 feed. You can leave a response, or trackback from your own site. I have a spice called Sumac which I have used to make some middle eastern dishes…is this also Zaatar by another name…. Sumac is usually part of a Zataar blend, its definitely in Lebanese Zataar blends. 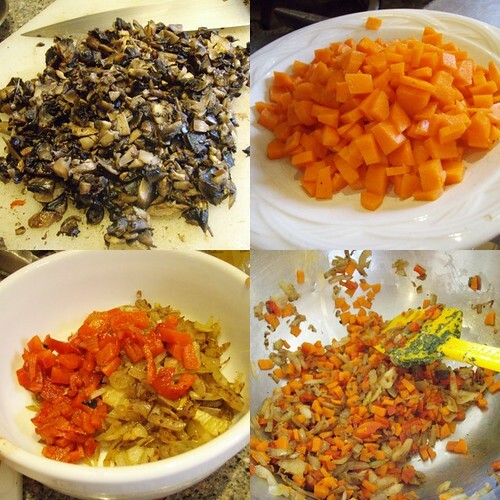 With this veggie kugel and the other low-glycemic index recipes, you certainly have adapted to the diabetic lifestyle quickly. You deserve a brownie-point (pardon the pun) for that! Jason and I paid closer attention to the numbers on the sides of the matzo boxes, as we were eating them with our lunch time soup, instead of low fat Triscuits (Triscuits aren’t leavened, are they? lol) Anyway, I was having the Spelt and I commented that it tasted exactly like regular matzo. After reviewing the numbers, we find that it has only one gram of carbs less and just a few calories less than regular matzo. I suspect the spelt matzo may be made with spelt flour, but not necessarily whole grain spelt flour. The whole wheat matzo has a much more whole wheat flavor and consistency, less carbs, more fiber, and a little more fat (this would be because whole grains contain the germ, which is where the fat is, and non-whole grain flours do not). So, if you are going for the whole grain/low carb choice, check the numbers and you’ll probably end up with the whole wheat as well. This is exactly what I was looking for! How many servings can I expect from this recipe? A bunch. ;) That’s a bundt pan ring, a dozen servings or so I guess. I wish I had the patience to bake this. I just buy them and they really taste great.